Movie Night: The Great Locomotive Chase is a 1956 Walt Disney Productions CinemaScope adventure film based on the real Great Locomotive Chase that occurred in 1862 during the American Civil War. 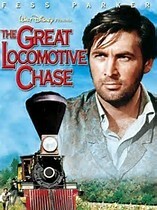 The film stars Fess Parker as James J. Andrews, the leader of a group of Union soldiers from various Ohio regiments who volunteered to go behind Confederate lines in civilian clothes, steal a Confederate train north of Atlanta, and drive it back to Union lines in Tennessee, tearing up railroad tracks and destroying bridges and telegraph lines along the way. On March 25, 1863, Cpl. William Pettenger along with 7 other soldiers, are summoned to the US War Department and are brought before War Secretary Edwin Stanton to receive the first Medals of Honor. Pittenger, narrating, tells the story of the mission they participated in through a flashback.